No better way to celebrate a big thaw than an impromptu field trip. We rounded up kids, friends and friends’ kids and headed for the North Carolina Arboretum in Asheville. Our first stop at the Arboretum was the Baker Exhibit Center. Denise had checked online before we left and said there was a dinosaur exhibit there. I was curious to find out how dinosaurs were going to be exhibited at the Arboretum. Like most things at the Arboretum it was totally cool. The exhibit “Be the Dinosaur: Life in the Cretaceous” combines a lot of different technology and visuals to create a terrific hands-on learning experience for kids. Video game technology is used to create this interactive experience described online: “The simulation at the core of this exhibit is, to-date, the most complex simulation of dinosaurs and their world ever created. For the first time, artificially intelligent dinosaurs roam across realistic terrain. The dinosaurs have simulated muscle and digestive systems. Virtual winds circulate digital odors. Plants grow and have accurate nutritional values. In order to prepare for a trip into this exciting virtual world, visitors will need to “dig” through other exhibit components to unlock the secrets of how dinosaurs survived, and thrived.” Other parts of the exhibit included full-size dinosaur bones and robotic dinosaurs from the Catawba Science Center. We left the Cretaceous Era and went outside where we found an eight-foot hummingbird, a five-foot butterfly, a huge green darner dragonfly, a bison with calf, a gardener, a lawnmower and more. All of these stunning exhibits were made from LEGOS. There are 27 sculptures in all, displayed in 14 different settings throughout the exhibit hall and grounds. Sean Kenney created the sculptures. Kenney, a children’s book author and only one of 13 official LEGO Certified Builders in the world, used half-a-million LEGOS for the exhibit. The bison and calf required 45,143 LEGOS. I’m not sure how much longer the LEGOS exhibit will be around, according to the Arboretum’s website the exhibit was supposed to close on January 5. After the LEGOS we hit the Bent Creek Trail. Our original plan was to hike to Lake Powhatan and back. However with kids taking every little spur that went to the creek and with adults in full leisure-stroll mode we didn’t make it. It was still a wonderful outing on a mild winter afternoon with friends and family. We even managed to run across a couple of notable natural-history encounters. We found a witch hazel that looked as if it had just recently lost its petals. The ovary and sepals were in still place creating the illusion of a small delicate flower. The genus name for witch hazel, Hamamelis means “together with fruit” and refers to the fact that you can often find this year’s flowers together with the fruit from last year. However, our shrub had lost this year’s flower and jettisoned last year’s fruit, leaving just next year’s developing fruit. 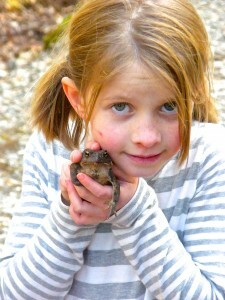 We also ran across a toad. 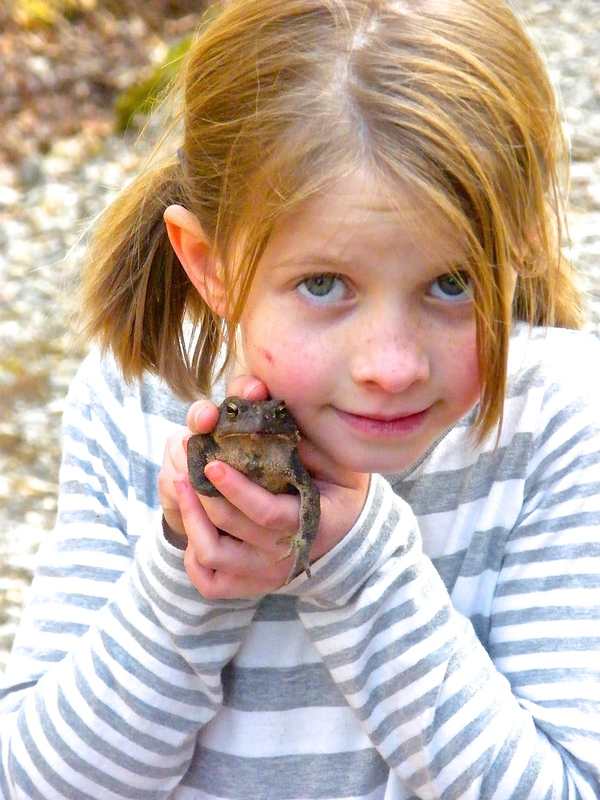 I think it was an American toad but I didn’t examine it closely. I was too busy getting a picture of Maddie and her prince. It’s not unheard of to see a toad on a 55-degree winter afternoon but I was a little surprised because it has been so bitterly cold recently. The kids fashioned it a crude burrow and placed dry leaves over it, I’m sure it was grateful.